Last month, a charming story made the rounds on the internet. Bob and Fontelle Harrod, childhood sweethearts, found each other after 59 years and were married on June 29. But a month later, the story has taken a sad turn. Bob Harrod, 81, has been missing since last Monday. His new wife, Fontelle, was set to move in with him this week, and police say that Harrod may have been "overwhelmed" by the situation. "His wife is very worried," says Detective Corinne Loomis of the LAPD. "Maybe he's off cooling off some place, but to think he would blow her off like that doesn't make sense. There are things in his home that indicate he was planning on welcoming her into his home." The couple were reunited by Fontelle's daughter, Leisa, who helped her mother track Bob down after Fontelle's husband passed away. 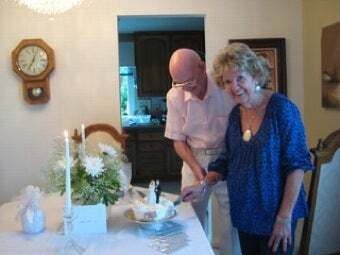 The couple were engaged decades ago, but Bob cut off all contact with Fontelle during his stint in the Korean War, leaving her confused and heartbroken. She eventually moved on, but claims that Bob is "the only man I ever loved," and the two were finally reunited and married last month. While police are still uncertain as to why Harrod has gone missing, Fontelle still hopes he will return: "I have waited, I don't want to be lost again without him. I want him to come home if he can." Meanwhile, police are asking that Harrod make contact, just to let his family know that he's alright. Says Loomis: "If you don't want to come home and you had second thoughts and want your own space and life back, we will respect that."